Five years ago, her family land in Donghu village near the city of Wuhan, was bought by the Chinese government for property development. She used the compensation money to buy property which now includes 17 apartments worth some 10 million yuan ($1.6 million), according to the Wuhan Evening News. 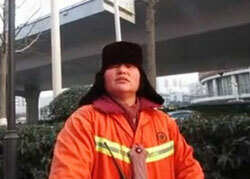 Nevertheless, six days a week Mrs. Yu dons an orange coat and goes to work as a street sweeper, earning a monthly wage of $227. The head of her cleaning team, Fu Guoju, noted that Mrs Yu had never been late for work and had only asked for three days off in the last 14 years in order to attend the funerals of her mother-in-law and father. Mrs. Yu’s son is currently working as a driver in her home village for $192 a month while her daughter sells tickets at a movie theater for $320 a month.